179. Can you use a single permission Set for multiple users? Ans - Yes, this can be done. Permission set once created can be added to multiple users in the related list of user detail page or at once for multiple users through Set up. 180. Can analytical snapshot continue working properly if the running user is inactivated? Ans - No, the snapshot will fail if the running is inactive. 181.Can you import User data through import wizard? Ans - No this cannot be done. 182. Can you import Custom objects data through import wizard? Ans - Yes, custom object data can be imported by import wizard. 183. If you have a custom object acting as detail to a master-detail relationship (standard object), what will be its organization-wide default set to? Ans - The OWD for detail object will always be 'Controlled by Parent' and this cannot edited. 184. In the salesforce MVC architecture where will you categorize standard or custom objects? 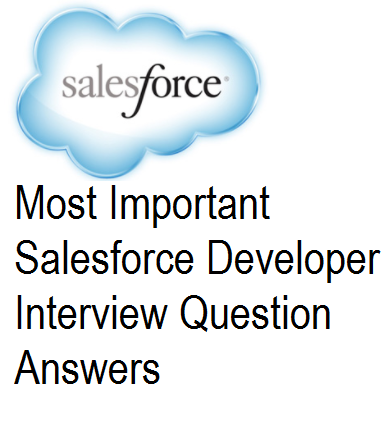 Ans - Standard or custom objects fall under model layer of salesforce MVC. 185. View or Edit permission on document, report, or dashboard depends on whether the user has access to folder in which they are stored, TRUE or FALSE? Ans - Yes this is TRUE. 186. What are the different types of groups that you can create in salesforce? 187. What is the use of permission sets? Ans- Permission sets can be used to extend a user's functional access without changing the assigned profile.